Our last day in Moab, and it wasn't even a full day. 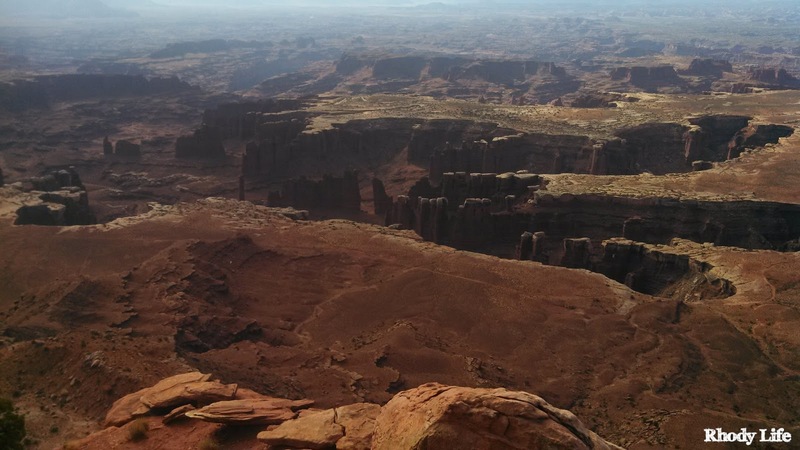 To make the most of it, we packed up our things in the hotel room, and got on the road, with plans to stop in Canyonlands National Park one last time before leaving the area. The drive in was beautiful, once again, and the sun was shining down on the grass perfectly, making it an amazing shade of gold. 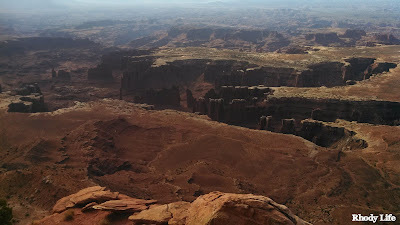 We were originally only going to go to the Grand View Point Overlook, but as we were driving by the parking lot to Mesa Arch, we noticed that it was completely empty. Finding the parking lot to a major feature of a National Park empty is a big thing, so we pulled in and walked the trail to the arch to find peace and quiet, with not a single person around. We took full advantage of this with taking pictures of the sun hitting the arch perfectly and pictures of us in front of the camera using the timer setting. After spending about fifteen or twenty minutes there, we started hearing a tour group coming, so we finished up our pictures and we started our walk back to the car to head over to the Overlook. When we got there, we were amazed at the view that we had. Since the park is separated by the canyon, there is a gorgeous view of the canyon and then off into the distance, you can sort of see the start of The Needles section of the park. There is a trail that goes along the cliffs of the canyon, which comes out to about a mile in each direction. As you round the cliff edge along side of the canyon, you are greeted with the most spectacular views that change with every turn that you made around the cliffs. Going in the morning was definitely the best decision, too, because the light that was shining off the side of the canyon and into the empty riverbed showed the rocks' beautiful red color. The experience was amazing, but before we knew it, it was time to head out of the park and make our drive up to Salt Lake City, where we would return our rental car and spend the night before starting our drive to Yellowstone National Park. I know that this is the fifth post about Moab, but it's the last post. Some of you may be tired of seeing the same landscape for the last few days, but it's just absolutely captivating, and I wanted to share it with you in case you didn't know how amazing it actually is. I hope that my posts about Moab, Utah have put this gem on your radar, and that you add this to your vacation destinations. Plus, it's pretty well located, and you could get there from flying into Salt Lake City or Las Vegas, which would be a whole other story too. Are you looking forward to my posts about Yellowstone? Do you have your vacation to Moab planned yet? So jealous!!!! I could look at 10 more posts of beautiful pics!